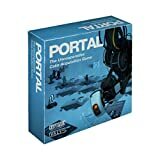 I haven't had a chance to play the Portal video game yet, but I get the unique concept of solving puzzles by teleporting around. These cool new Portal Bookends are bookends that look exactly like a test subject going through a portal on one side, teleporting through the books and then safely emerging through another portal on the other side. So whether you've played the game or not, as far as bookends go, these will definitely cause a few double takes.